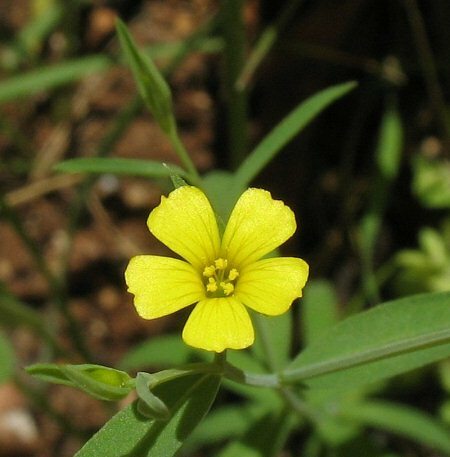 ﻿ Linum trigynum (Southern Flax) : MaltaWildPlants.com - the online Flora of the Maltese Islands. Glabrous annual; stems 10-30 cm, erect or ascending. Leaves 1-2(-3) mm wide, linear-lanceolate to narrowly elliptical, with smooth margins. Sepals 3-4 mm, shortly acuminate with glandular-ciliate margins and setaceous apex. Petals 4-6 mm, yellow. Stigmas linear. Capsule c. 2 mm, subglobose; beak c. 0•3 mm. Homostylous. S. Europe, extending northwards to C. France and E. Czechoslovakia.